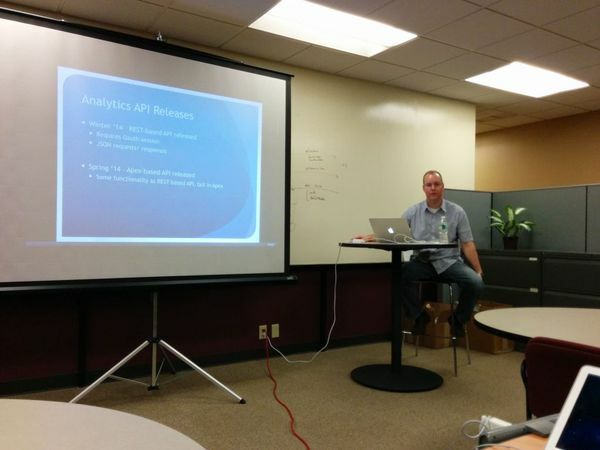 We recently had our first meetup of the The Lehigh Valley Salesforce Developer User Group. Jesse Altman and I had been thinking about forming a DUG in the Lehigh Valley for a while and finally we reached out to April Nassi (thanks April!) about getting one started. Jesse detailed the experience of starting the group in his post My Experience Starting a Developer User Group. Our host (my employer), Trifecta Technologies provided a great area for the presentation, for eating food, and for everyone attending to hang out and get to know one another. Salesforce.com provided some awesome swag in the way of technical books, cheat sheets, shirts, hoodies, etc. The meetup started with dinner (pizza and chips, of course) and time for everyone to get to know each other. After dinner and socializing, Jesse kicked off the presentation portion with some general announcements and an explanation of what the DUG is and what the plans are for it. Then he handed it over to me for my presentation on the Analytics API in Apex. I had a blast presenting to the group. The Analytics API in Apex is only just being released in Spring ’14, but I had done a decent amount of experimentation, so I was excited to be able to share what I had learned with others. I covered all of the content in my slides and also logged in to a pre-release org and demoed some Visualforce pages that I created that use the API. I explained some of the Visualforce and Apex controller code while showing it in the Developer Console. As Jesse mentioned in his article, we created a YouTube Channel as a place to post all of the group’s presentations. Unfortunately, the audio did not record correctly, so I gave the presentation again two days later and recorded that. In his article about starting a developer group, Jesse wrote that one of the goals of the group would be to try to make the meetups feel like mini Dreamforces. One of the things that I liked most about Dreamforce, aside from the awesome technical sessions, was how it supercharged my Salesforce battery. Being around a bunch of other people that share an enthusiasm for Salesforce (and tech), can’t help but do that to someone who is already pretty enthusiastic. Our group’s meetup was definitely just like a mini Dreamforce in that respect. Our first meetup was a huge success and I’m already looking forward to the next one! Great post Peter. I agree with all of the above! It was awesome!